My thoughts: I don't read much sci-fi but when I do it's usually space opera and I love it. 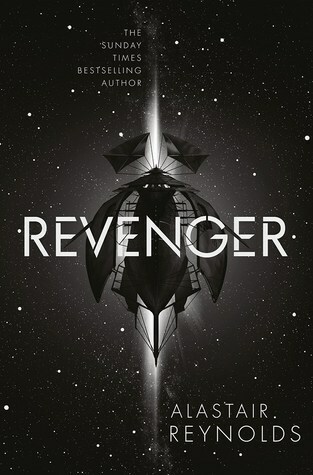 I was excited to read about Revenger and never having read an Alastair Reynolds book it seemed like a good place to start. Revenger is narrated by Fura Ness, who is on the verge of adulthood when the story begins. I definitely felt like there was a YA turn to this book for the first section but having finished, I think it's a clever reflection of who Fura was then, and her innocence, and gives another way for Alastair Reynolds to show how she changes over the course of the story. This is not a happy story. To start with, there's some adventure, some tension, but it's still quite fun. Then things get dark, and they stay pretty dark and tense for the whole story. To avoid spoilers, I'll just say that something happens with the crew of Rackamore's ship and it sets Fura on a path to seek revenge. She becomes very determined, to the point of being single-minded, in that pursuit. I found that as the book went on, I worried more and more for Fura and who she was becoming, as well as finding her less likeable. I agree with what Sarah says about Revenger in her review: a lot happens in the book and I would have liked it to slow down in some places and focus more on some big events. With fitting in so much to the story, some parts felt rushed. If I sound negative here, I don't mean to - it was an incredibly action-packed book that I could hardly put down, as my co-workers will attest. I really enjoyed the story and was on the edge of my seat on many occasions, waiting to see if characters would get through the next scrape. The writing was very good, as you'd expect from someone with Alastair Reynolds' experience and I'll definitely be reading more of his work in future. I feel like there might be a sequel down the line as the ending definitely left lots of potential for a continuation of the story but the main conflicts of Revenger did all get wrapped up. This was a nail-biting adventure through space with all the danger and wonder you would hope for in a space opera. I'm giving it 8 out of 10, and I definitely recommend it to sci-fi fans. Thanks for the mention! :) I'd agree, it's pretty dark going and Fura has quite a traumatic transformation!